I thought I’d check back in on Squidoo and Hubpages now that the Google Farmer Update (Panda update) has had some time to work. Short-term results can suggest major upheavals, but it’s the long-term stats that really mean something. Keep in mind that the update was only for Google’s US search engine. It hasn’t yet been unleashed globally. The drop in U.S. users is included in “global” as well as “local” results. My prediction, based on what I’m seeing, is that after this change, Hubpages’ traffic is going to be nearly the same as Squidoo’s. It already is within the US. Jennifer Ledbetter of Potpiegirl.com made a mini study of specific spam phrases confirming by the numbers my guess in my last post on the Farmer Update: Squidoo’s ongoing spam crackdown means it has fewer (but alas, still some) pages on the most spammy topics than Hubpages and several other sites. This DOES explain why ehow.com didn’t lose places in the SERPs: it has even fewer pages matching these spam phrases. Jennifer didn’t test this, but we both also argued — in different ways — that Hubpages’ much, much stricter policy on outbound links may be causing it some trouble. She pointed out that links on Hubs are nofollowed until you’ve reached a certain status. I related my experience of having all my hubs locked for having one link on each of them to cite the source of my photos. Squidoo’s got a nine outbound link per domain limit, instead, and it nofollows affiliate links in its merchant modules. Various other ideas have been thrown out to explain the change. Another thing I pointed out is the significantly lower bounce rate of Squidoo compared to Hubpages, ezinearticles, and (of course) mahalo. 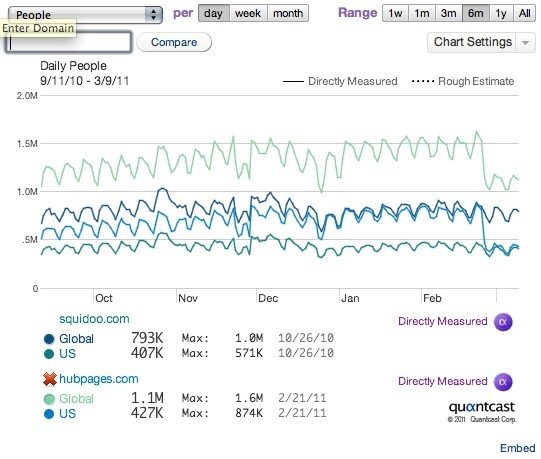 The Quantcast traffic charts show Hubpages U.S. traffic simply dropped back to Squidoo’s levels. If my explanations and Potpiegirl’s guess about outbound links were correct, Squidoo should now be outperforming Hubpages. But it’s not. They’re now about the same. Jennifer’s spam study shows that Squidoo has fewer pages than Hubpages on the spammy topics she chose to test, but not all that much less. The last phrase she checked (“tv for pc”) actually had more pages on Squidoo than Hubpages. (It really shouldn’t be filtered as spam; how to watch television on a PC is a reasonable query. It’s just gotten targeted by a lot of spammers trying to cash in on a popular search). So my vote is on the spam being the deciding factor — as it should be — about how Google’s picking “quality” sites. Let’s keep reporting and flagging it when we see it, folks, and for goodness’ sake don’t write on a Squiddont topic! Also, don’t give up on Hubpages. It’s gotten humbled, but it’s no worse off than Squidoo. And keeping eggs in different baskets is always a good practice.